Both that first Wanborough School and its 1871 replacement were at Pond Hill Wanborough, located off the present unmade track leading from West Flexford to East Flexford being a continuation of Flexford Road at Flexford Lane. By the 1850s, the number and effectiveness of National Schools throughout the country were sufficient to arouse the interest of the truly rural pastor and gentry to the real and urgent need to establish a school within their own parish. The National Society, in 1816, realising the difficulties confronting the rural parishes to find funds with which to build a school, had suggested that a good barn could be converted easily and economically into a building suitable for a school, reporting that "A barn furnishes no bad model and a good one may be easily converted into a school". Did this imaginative suggestion appeal to Mrs Mangles of Wanborough Manor, who might well have founded that first school for the families, retainers and workers of the Wanborough Manor Estate? The 1871 Ordnance Survey map shows a building labelled "school for boys and girls", the outline of which corresponds to the present "Wildfield" dwelling. Inspection of the dwelling indicates solid chalk (Clunch) construction and in 1920, when the dwelling was extended, further evidence was found of a previous steep stairwell or ladder giving access to an upper storey. Piercing of those upper walls evidenced again the use of Clunch. Perhaps there is credence for the conversion of a rural building? Regarding that school of 1867, Miss Maria Stedman was stated as the Mistress on the opening page of the first mandatory logbook and the Rev Chilton is entered as Corresponding Secretary. He was Secretary until 1894 and succeeded by the Rev Raywood Firth in 1895. It is highly probable that Miss Stedman had held the post of Mistress from when the school started, for when she left in the September of 1868 following "the harvest vacation" that commenced on the 9th of August, her successor, Miss Maria Paxon, who arrived in the October to take charge of the school, did not make an auspicious start for H M Inspector noted in his report "that the order and discipline seemed to be not so well maintained as in former years". Miss Paxon was, nonetheless, to dutifully serve Wanborough School for the next 24 years, retiring in the May of 1902. For Miss Paxon, 1871 was a very agreeable year. Mr McKibben, the new owner of the Wanborough Manor estate visited the school in the October and promised the children a good seat at the proposed opening of the new school and school-house, built at his own expense in the corner of the adjoining field. That building is now the defunct Wanborough Youth House. In the following May, the first assistant teacher, Miss Caroline Fish, was appointed, and in June, Miss Paxon took up residence in the schoolhouse. The report of the Inspector in 1873 was far more encouraging, complimenting her on her able administration of both the religious and secular teaching of the children. Mrs Beeney, Head teacher from 1899 to 1903, lived in the school-house with her husband and Head teacher Mr Marriott from1905 to 1925 lived there with his family until moving to his own house, "Holly Bank" in Station Road, now Glaziers Lane. Mrs Stoakes, caretaker of the school, lived there with her two daughters Irene and Bessie and later, Bessie returned as Mrs Morgan to visit her mother in 1934 and gave birth there to her own daughter, who attended the school as a pupil in 1945. The school consisted of one main room 35 feet by about 17 feet (heated by a single stove), divided by a screen into two departments to segregate the younger children from the older ones. The larger part was for the older boys and girls with about 11 boys and 7 girls and the other for the younger ones, of which there was a similar mix of boys and girls. The average daily attendance was 30 pupils. Water was brought to the school by pails from a tap sited some distance away supplied by pipe from a spring at Wanborough Manor. On 18 January 1904 the school was declared a County Council School and water was eventually connected to the school in March 1909. On the 30th November 1945 the Education Committee reported that "the number of children on the register of this school is now 11 and the Divisional Executive recommend that steps should be taken to close the school at the end of March 1946" In June1946 the Education Committee reported that the school closure was completed on the 11th April. The committee was of the opinion "that the buildings can usefully be utilised in connection with camping facilities to be made available on the site and this matter is under consideration by the Youth Sub-Committee". 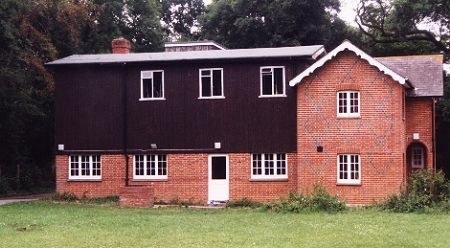 In 1948 the Education Committee referred to the facility as "Wanborough Camp House" and following extension works and modernisation the new facility was called "Wanborough Youth House" subsequently closed in 2007. The once striking and decorative brickwork of the fine old Victorian building can only be fully seen on the facade of the schoolhouse. The pretty dormer windows that permitted light into the schoolroom and gave the building a "cottage" appearance no longer exist having been replaced with a drab wooden cladding. Perhaps one day the building may be sold and converted into a smart dwelling.